Identify trends in top-selling items over time to highlight, for example, peaks during certain periods (such as Christmas or sporting seasons). Compare how top-selling items vary between different user segments. Compare real currency and virtual currency top-sellers. Use the top-selling item data to plan targeted in-app messages or push notifications. For example, you might notice that a particular item is popular with users in a high-spenders segment. In this instance, you could target promotional in-app messages at those users to encourage them to purchase similar or related items. For more information about in-app messaging in Swrve, see Intro to in-app messages. For more information about push notifications, see Intro to push notifications. Identify top-selling items that would make good candidates for resource A/B testing. For example, if an item is not generating as many unit sales as you would have expected over time, you could investigate whether you should reconsider the pricing of the item by performing a resource A/B test. For more information about resource A/B testing in Swrve, see Intro to resource A/B testing. 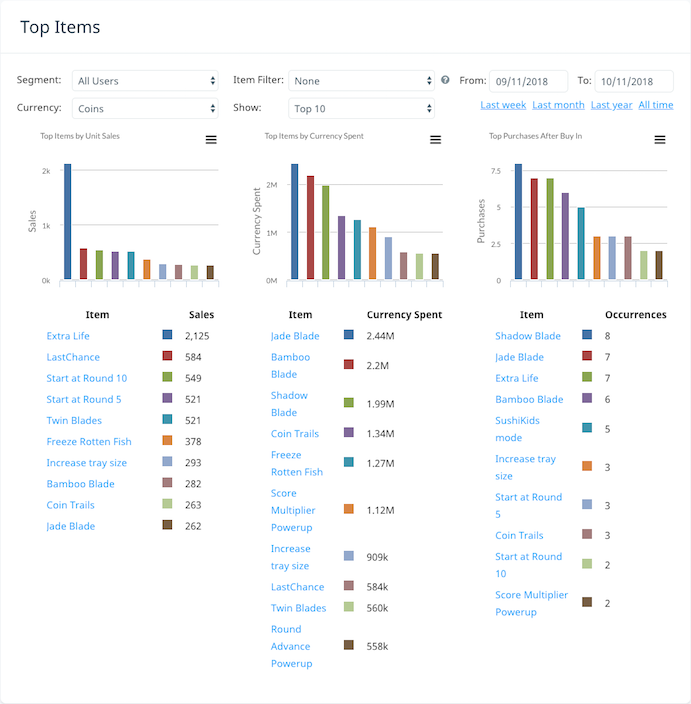 Swrve tracks top-selling items (in real currency) by means of IAP events and top selling items (in virtual currency) by means of purchase events. For technical information about sending events to Swrve, see the platform-specific Integration guide. Top Items by Unit Sales. Top Items by Currency Spent. The user had some virtual currency (such as coins or gems) available, saw the item and purchased it. The user started with no virtual currency but wanted to buy the item. They visited the store, bought virtual currency and then immediately purchased the item. This is what is captured in the Top Purchases After Buy In chart. A purchase event represents a user swapping real money for virtual currency. For example, a user spending $0.99 on 100 in-app gems. An IAP event represents a user spending real money for some reward (which might include virtual currency). For example, the user spends $1.99 on a bucket of gems which gives the user 1,000 gems and a free sword. In either of these cases, Swrve treats the user as having just purchased gems. When the user then proceeds to buy an item using gems as the currency, Swrve includes that item once in the Top Purchases After Buy In chart. Swrve then resets the user to no longer having just purchased gems. Swrve has a separate store per-user per-currency, so a user can be marked as having just bought more than one currency. A user that is marked as having purchased gems and coins would have to make one purchase in gems to update the Top Purchases After Buy In chart for gems, and then another purchase with coins to update the chart for coins. The Top Purchases After Buy In chart and table are empty if you select USD from the Currency list. Filter the data by segment, currency and item filter. Limit the data to include the top-10, top-100 or all top-selling items. Print each of the Top Item bar charts. Save the data for each of the Top Item bar charts in CSV file format. The following sections provide information about how to customize the data included in your Top Items report. Select a set time range (Last week, Last month, Last year or All time). Segment – filter by user segment. Currency – filter by real currency (USD) or by any of the virtual currencies that have been defined for your app. You usually define the virtual currencies that are required for your app when adding platform titles as part of the Swrve onboarding process. You can also edit platform titles (including the app currencies) later on, if required, on the App Settings screen. For more information, see How do I edit existing platform titles? Item Filter – apply a particular item filter. Item filters are sub-sets of grouped items. You define item filters on the Resources screen. To access this screen, on the Optimization menu, select Resources. For more information about defining item filters, see Intro to Swrve analytics. To limit the number of top-selling items to include the top-selling 10 items, 100 items, or all items, select the required value from the Show list. The following sections provide information about the additional actions you can perform on the Top Items screen. To print one of the three Top Item report bar charts, on the menu in the top right-hand corner of the chart, select Print. Depending on the type of browser you are using, the print screen or print dialog box displays. Define your required print settings and print the Top Items graph. To save the data from one of the three Top Item report bar charts in comma-separated value (CSV) file format, on the menu in the top right-hand corner of the chart, select Download CSV.